The 6.0L Power Stroke engine utilizes torque-to-yield head bolts. Simply put, these are bolts that stretch just the slightest bit when they are tightened to spec. As a result, they become permanently elongated. In some cases, the preload that is caused by the elongation of the bolts can limit the strain applied during load, helping to combat metal fatigue. That’s why this type of bolt was used in 6.0L Power Stroke engines – the idea is that they would last longer than conventional bolts. However, when more power is produced within the engine than the bolts were designed to contain, the bolts stretch a little too much. And when head bolts stretch, gaskets don’t seal correctly and get burned up. Cylinder head damage follows, and at this point we’re talking about major engine carnage. It’s also important to note that the 6.0L Power Stroke engine uses less head bolts than the older-generation 7.3L Power Stroke. Fewer bolts equates to less clamping force, which can be problematic even in stock-power 6.0L engines. 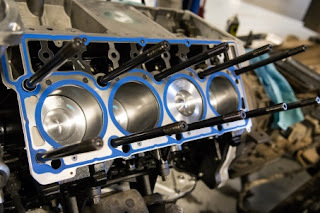 If the EGR cooler within the 6.0L ruptures (another common problem), coolant can get into the cylinders, which creates steam and stretches the bolts. Once again, a burned up gasket and eventually a blown head will most likely be the result. 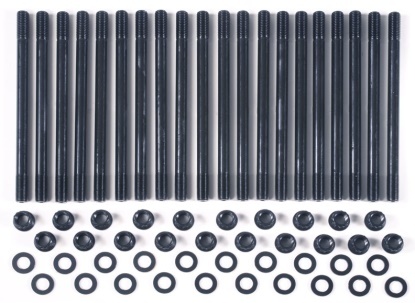 It’s also worth mentioning that stock 6.0L head bolts can’t be reused after being loosened, because they stretch too much to be re-applied effectively. 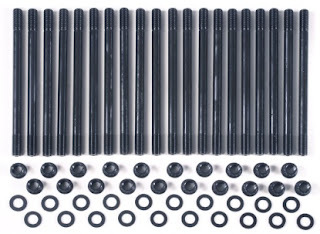 For those wanting to add more power to the 6.0L, finding a solution to the stretching head bolts is a necessity. But with the understanding that even stock-power 6.0L engines can be damaged as a result of stock bolts not being up to task, we can consider this kind of occurrence a common pattern failure. A shortcoming of the engine configuration. But there is a solution: head studs. Studs look a lot like bolts, but are threaded on both ends. A separate nut is used, and this configuration can provide greater tension than a typical bolt. A conventional bolt gets twisted as it is tightened, so it’s reacting to two different forces at the same time. With a head stud, the vast majority of force gets applied to the vertical axis, so a more even clamping force is the result. And clamping force is what we’re after here. Some studs, like the ones produced for the 6.0L by ARP, are threaded after heat treating is completed. This can increase fatigue strength by more than 2000% - that’s 20 times the resilience! At this point, the advantages provided by head studs are pretty clear. Greater and more even clamping force, better resistance to fatigue, and the capacity for re-use all combine to make head studs a solution for 6.0L owners who are serious about reliability or are preparing for monster power.